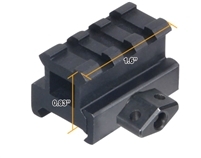 The Primary Arms Absolute Cowitness Micro Dot Riser allows for a lower 1/3rd cowitness on AR15 and similar platforms when combined with any Primary Arms Micro Dot, as well as many other standard Micro dot designs. When looking down the iron sights, the red dot will be placed in the bottom part of the Micro dot’s scope tube. The lower 1/3rd cowitness setup allows a less obstructed view of the entire scope tube when using the red dot instead of the iron sights. The light weight design, constructed of anodized aluminum, is easy to install. 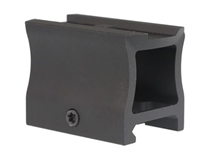 The Primary Arms Absolute Cowitness Micro Dot Riser allows for an absolute cowitness on AR15 and similar platforms when combined with any Primary Arms Micro Dot, as well as many other standard Micro dot designs. When looking down the iron sights, the red dot will be placed in the middle of the Micro dot’s scope tube. The light weight design, constructed of anodized aluminum, is easy to install. The riser features a 3-year limited warranty.